There are so many good designer new arrivals at Neiman Marcus this week! I spent about 30 minutes yesterday saving my favorites, including this Oscar de la Renta dress and this Alexander McQueen tunic/dress. This tuxedo shirt by 3.1 Phillip Lim is also on my wish list – such a beautiful basic! Take an additional 60% off all sale items at OTTE with code EXTRA60 at checkout! This Phillip Lim embellished skirt and this OTTE Signature dress are in my shopping cart. Click here to shop the sale now! Theory’s Winter Sale continues with more styles at up to 60% off original prices! This leather-sleeved blazer is fantastic and there’s nothing better than a classic pair of leather pants. #1, 7, 12, 14 are killer, great picks! I love that bathing suit! Great picks! So much to love here that it’s hard to pick a favorite – but I adore the unique design of that bracelet and the shoes are stunning! 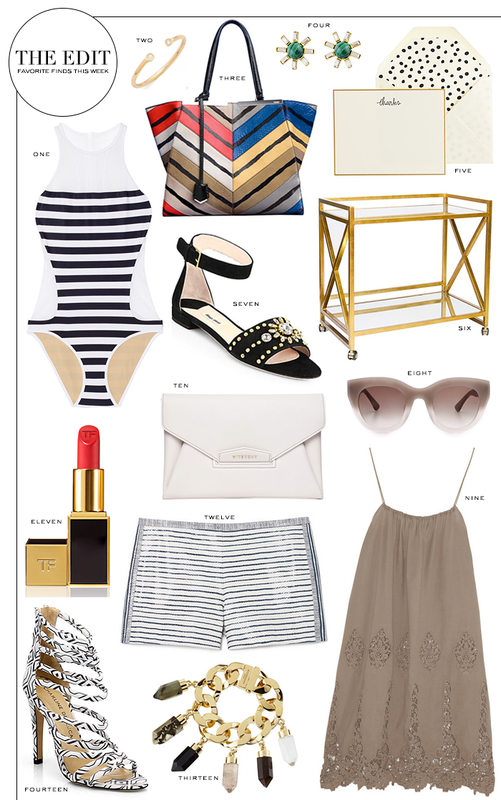 That swim suit with that red lip, could there be a more glamorous pairing? Love! Need #12 now! Leather striped shorts, yes please!! Your Edits make it so hard for me to stay on my spending freeze. Ah! I want #9 for my upcoming trip to Florida! NEED that bar cart in my life! And everything else on this list! I need EVERYTHING! :) Those sunglasses are amazing. I don’t even know where to begin because they are all so stunning! Such cute stuff! Love that little cotton dress! Those thank you notes are adorable and I’m in love with that bar cart! These are such fun picks! I love the bar cart! Love these picks! Those Loren Hope studs and the Givenchy bracelet are amazing. All of these picks have me longing for warm weather. That striped bathing suit is gorgeous! And I love the little dress. And of course the shoes are both amazing! Great picks as always! I love Ariel Gordon jewelry! Too bad those sunglasses are sold out. They are very cool and I bet they would be extremely flattering since the color is so neutral. I would love to hear your thoughts on my latest blog post when you get a chance. omg. yes. yes. yes. you have a killer eye! what a perfect lil’ edit! that alexander wang bathing suit is kinda completing my life right now! Great picks! Love the cart…headed to the sale! Love the flats and the heels! SO pretty. & I’m pretty sure everyone should be allowed to have a bar cart in every room of their house. No?